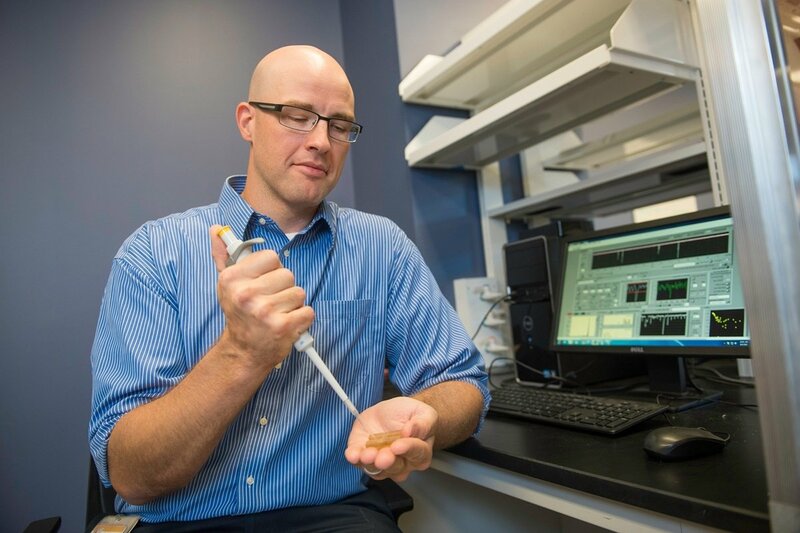 For the first time, scientists at Wake Forest Baptist Medical Center have been able to measure a specific molecule indicative of osteoarthritis and a number of other inflammatory diseases using a newly developed technology. This preclinical study used a solid-state nanopore sensor as a tool for the analysis of hyaluronic acid (HA). HA is a naturally occurring molecule that is involved in tissue hydration, inflammation and joint lubrication in the body. The abundance and size distribution of HA in biological fluids is recognized as an indicator of inflammation, leading to osteoarthritis and other chronic inflammatory diseases. It can also serve as an indicator of how far the disease has progressed. “Our results established a new, quantitative method for the assessment of a significant molecular biomarker that bridges a gap in the conventional technology,” said lead author Adam R. Hall, Ph.D., assistant professor of biomedical engineering at Wake Forest School of Medicine, part of Wake Forest Baptist. The most widely used method is gel electrophoresis, which is slow, messy, semi-quantitative, and requires a lot of starting material, Hall said. Other technologies include mass spectrometry and size-exclusion chromatography, which are expensive and limited in range, and multi-angle light scattering, which is non-quantitative and has limited precision. The study, which is published in the current issue of Nature Communications, was led by Hall and Elaheh Rahbar, Ph.D., of Wake Forest Baptist, and conducted in collaboration with scientists at Cornell University and the University of Oklahoma. In the study, Hall, Rahbar and their team first employed synthetic HA polymers to validate the measurement approach. They then used the platform to determine the size distribution of as little as 10 nanograms (one-billionth of a gram) of HA extracted from the synovial fluid of a horse model of osteoarthritis. The measurement approach consists of a microchip with a single hole or pore in it that is a few nanometers wide – about 5,000 times smaller than a human hair. This is small enough that only individual molecules can pass through the opening, and as they do, each can be detected and analyzed. By applying the approach to HA molecules, the researchers were able to determine their size one-by-one. HA size distribution changes over time in osteoarthritis, so this technology could help better assess disease progression, Hall said. “By using a minimally invasive procedure to extract a tiny amount of fluid – in this case synovial fluid from the knee – we may be able to identify the disease or determine how far it has progressed, which is valuable information for doctors in determining appropriate treatments,” he said. Hall, Rahbar and their team hope to conduct their next study in humans, and then extend the technology with other diseases where HA and similar molecules play a role, including traumatic injuries and cancer.